This is a beautiful ride and a fairly easy circuit, following quiet roads through an idyllic rural backwater. The small village of Idanha-a-Velha is a must-see for any visitor to the region. 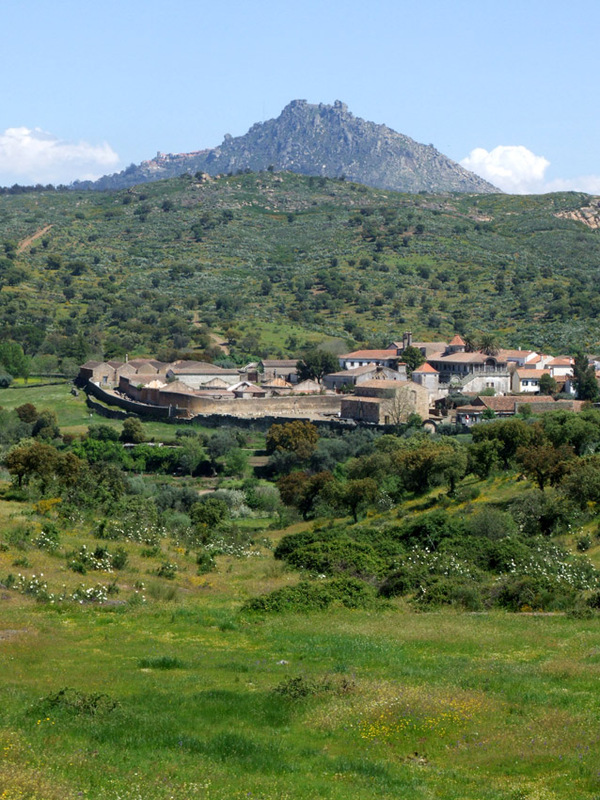 Although now little more than a hamlet, it stands on the ruins of a major Roman city from the 1st century BC. The city was once the seat of a bishop, birthplace of a 7th century king of the Goths and lasted until the 15th century – when a plague of rats apparently forced the inhabitants to flee! The ride also takes you very close to the beautiful village of Monsanto, built on a mountainside with a spectacular ruined castle above – well worth the effort (and a great place to stay) but it involves a serious climb. Total distance is 49km (30 miles). The cycling is easy-moderate. Most of it’s fairly gentle but there are a couple of steep hills. If you want to extend the ride and take in Monsanto (see below for details) this would extend the ride to around 62km (39 miles). However, be warned that riding up to the village involves several kilometres of serious uphill – and there’s then still quite a walk up to the castle. It can get hot (high 30s) around here in the summer – and cold in the winter. Best times are probably March-May or September-November. Come in the spring and you’ll also get carpets of wildflowers among the lush grass. Apart from the campsite, there’s a range of accommodation in Idanha-a-Nova, which would also make a convenient start and finish point for the ride. The town also has an Intermarche supermarket plus other shops, cafes and restaurants. There are a couple of small cafes in Idanha-a-Velha. Alternatively, Monsanto makes a fantastic overnight stop if you can get up the hill! The ride shown below starts and ends at the campsite, which not only makes a good place to stay for campers but is also worth visiting just for the scenery (shown below). The ride starts with a run down away from the Idanha Barragem (dam/reservoir) – followed by a reasonably stiff climb of about 1km as you turn east towards Alcafozes, after which it’s reasonably level. Turn north at Alcafozes on the N332 – then enjoy the downhill to Idanha-a-Velha, which is well worth a couple of hours of exploration. If you want to detour to Monsanto then you need to turn right just 800m from the Idanha turn-off on a small road signposted ‘Carroqueiro’ – see second map at the bottom of the page for details. Otherwise, continue northwards on the N332, climbing back up towards Medelim and then head west on the N329 towards Proenca-a-Velha – watch out for cobbles going through narrow streets here. There’s a few ups and downs as the road turns south but nothing serious until Idanha-a-Nova– from where the N353 drops steeply back down to the river. There are no particular sites of note in the new town but it’s a pleasant spot to stop – particularly for a cool glass of Sagres – and there’s a decent supermarket here. Huw & Carolyn Thomas, April 2010.